Google has launched a brand new feature for its artificially intelligent Google Assistant that’s designed to cheer people up by filtering negative news. 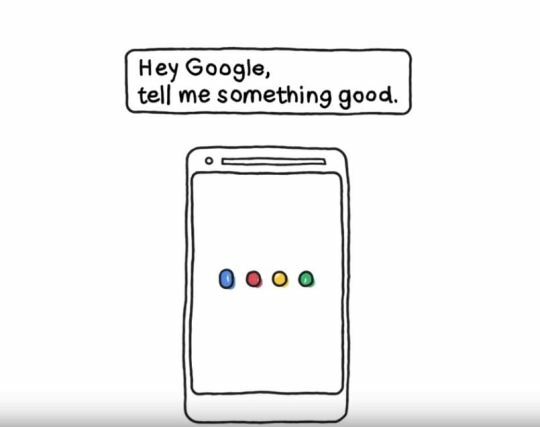 Simply ask your phone (or the Google Home speaker) to ‘tell me something good’ and you’ll be given a nice summary of positive stories about people solving real problems. ‘These days we’re consuming more news than ever, and sometimes, it can feel like there are only problems out there,’ explained Ryan Burke, a creative producer at Google’s Creative Lab. ‘But the fact is, there is a plethora of ‘good news’ happening, and we’re not talking about unlikely animal friendships or random acts of kindness. ‘Real people are making progress solving real issues—and hearing about those stories is a crucial part of a balanced media diet.’ The stories come from a wide range of media outlets, curated and summarised by the nonpartisan, nonprofit Solutions Journalism Network organisation. The company acknowledges that it’s not a magic bullet solution and that sometimes bad news is needed. But it argues the balance has tipped too far one way and suggests this is ‘an experiment worth trying’.